These are hard to find without writing. Each room entry had a blank to write in the monster and treasure, and sure enough just about every DM felt obliged to do just that. I can't tell you how many of these I've found with gorgeous covers, and then crushed to find writing all over inside. 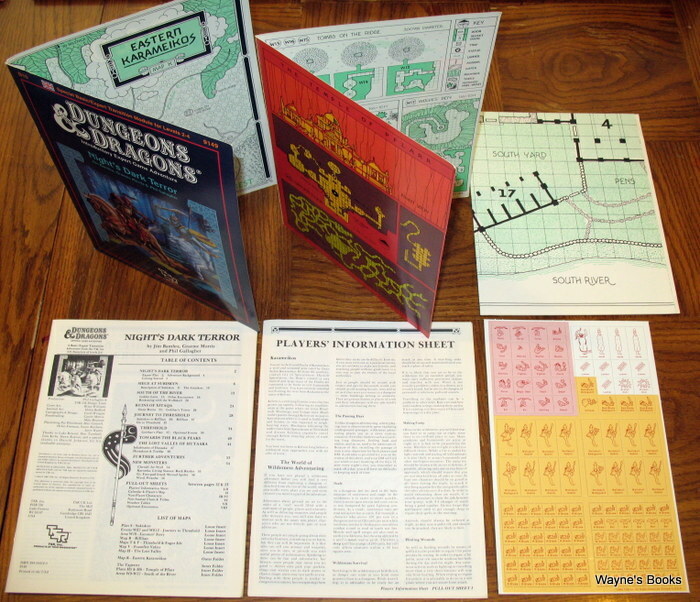 "This package (a cover folder with maps and descriptive booklet within) forms a complete module for use with DUNGEONS & DRAGONS Basic Set. It is especially designed as an instructional aid for beginning Dungeon Masters and players, specifically created to enable new Dungeon Masters to initiate play with a minimum of preparation. 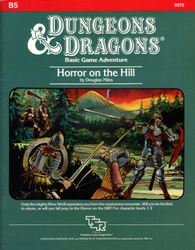 In addition to descriptive and situational material, this module also includes special informational sections giving: background history and legends, listings of possible monsters and treasures and how to place them, a list of adventuring characters, tips on various aspects of play for the Dungeon Master, and helpful advice for starting players." 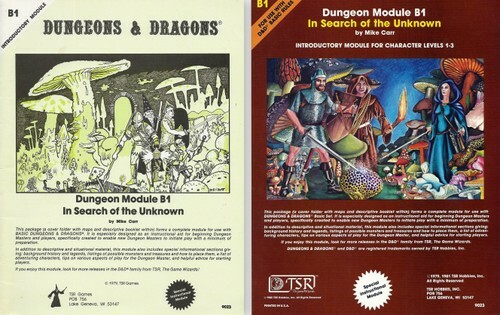 "This module includes a cover folder with maps and a complete description booklet to form a ready-made scenario for Basic Dungeons & Dragons. It has been specially designed for use by beginning Dungeon Masters so that they may begin play with a minimum of preparations. 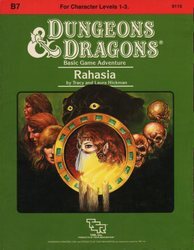 Within are many features to aid novice players and Dungeon Masters: legends, history and background information, a list of adventuring characters, tips on how to be an effective Dungeon Master, plus an interesting area for characters to base themselves in (the Keep) before setting out to explore the Caves of Chaos!" The 1st (orange) print was pulled before full publication due to controversy regarding poor quality and risqué art. The Acaeum has a good summary of what happened. The orange B3 is extremely rare today. * An orange B3 (Fine/Like New by my estimation) sold on eBay for $1,612.87 on Dec 29, 2013. * A similar condition orange B3 1st print sold on eBay for $2,325 on Apr 27, 2014. "Not long ago the valley was green and animals ran free through golden fields of grain. The Princess Argenta ruled over this peaceful land and the people were secure and happy. Then one day a warrior riding a white dragon appeared in the skies over the castle and almost overnight the tiny kingdom fell into ruin. Now only ruins and rumors remain, and what legends there are tell of a fabulous treasure still buried somewhere within the Palace of the Silver Princess." Some of these were published three-hole-punched. The 3rd panel of the cover (player's side) is titled "Ye Fast Pack" with three sample packs of gear their characters can choose to get into the adventure right away. The final printing of B4 has an updated cover layout to match the Mentzer edition of Dungeons & Dragons. The interior is identical to prior versions as far as I can tell. It would have to have been released in 1983 or later. They're relatively uncommon. "Lost in the desert! The only hope for survival is a ruined city rising out of the sands. Food, water, and wealth await heroic adventurers inside an ancient pyramid ruled by a strange race of masked beings. 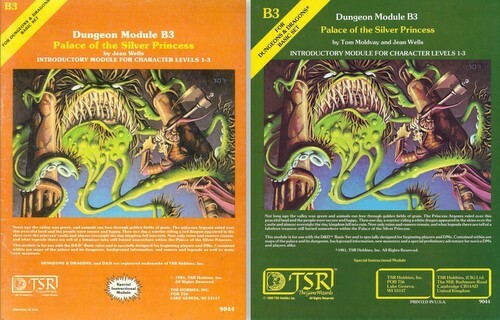 This module includes a cover folder with maps, and a descriptive booklet with a ready-made adventure for the DUNGEONS & DRAGONS Basic game. It also includes enough information to continue the adventure beyond level 3, using the DUNGEONS & DRAGONS Expert game rules." "The end of the road. A lonely fort stands on the banks of a mighty river. It is here the hardy bands of adventurers gather to plan their conquests of The Hill, the hulking mass that looms over this tiny settlement. 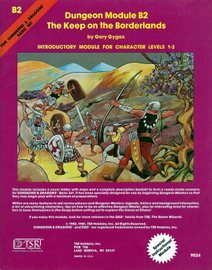 This module is designed for use with the D&D Basic Rules. 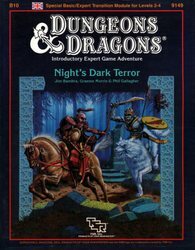 A trip through the wilderness begins a unique challenge for the novice player and Dungeon Master. Included in the module are 11 maps, 3 new monsters, and a complete set of prerolled characters." One of the earlier dedicated city adventures, this module is set in Specularum, the capital city of Grand Duchy of Karameikos. D&D's "Known World" ("Mystara") was new at this time. "The widow insists there are demons in her house. She hears them at night in her root cellar, and now they call out to her. But she is old and nervous and her mind often plays tricks on her. Two men, their heads fully sheathed in large, black hoods, dig quickly in the darkness of the cellar. The hole grows deeper as their shovels bite into the earth. "This will teach those meddlers their place," laughs the tall, hefty figure. "But it's too bad this was an accident," the shorter, slim figure says haltingly. "But don't you see the advantage?" snapped the tall man. "They will fear us now. They will fear for their lives." Grunting. they heave a sailcloth bundle into the hole. As it falls, a woman's hand dangles lifelessly from the folds. Who is the woman? Why will her death trigger riots and unrest in the city of Specularum? And the assassins: Are they Torenescu, Radu, or Vorloi? 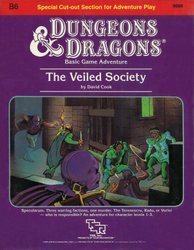 Or, curse of curses, the Veiled Society? This special game adventure provides a section of paper buildings and figures to cut out and use, giving you three dimensions to your game play!" See our blog for info on the original Daystar West Rahasia. "Gray Mountain lies deep in the lush elven forest. The temple there was a haven of meditation and learning - until taken over by an evil cleric known as the Rahib. Far under the mountain, he paces before the temple's great altar. A brown-robed servant rushes in and falls to his knees, trembling at the sight of the Rahib's black panther. "Rahib, adventurers came to the village as the sun rose - the strangers now protect Rahasia." A scowl crosses the Rahib's face. "I must have Rahasia! Attack again tonight." As the servant scurries away, a deep growl rises from the giant cat. Gripping the panther's leash, the Rahib paces again, speaking out loud. "We must dispose of these strangers quickly; the secret beneath the temple will not wait much longer."" "To a wizard, knowledge is power, and the wizard Lirdrium Arkayz wants to know the mysterious secret of The Rock. Many have tried to discover it - but The Rock keeps its secret well. The wizard offers a rich reward to anyone bold enough to solve this dark mystery. 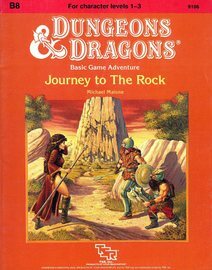 But the road to The Rock leads to danger and hidden peril - dangers that have claimed the lives of many brave adventurers. Rashness and folly will lead to quick death, but riches await the clever and the brave. Have you the wits, courage and skill to survive the Journey to The Rock?" "Five exciting short adventures to make your Basic campaign come alive! The Clearing of Castle Caldwell - A local merhcant has recently purchased a small castle...but when he tried to move in, he discovered that the castle was already inhabited! Dungeons of Terror - A strange trapdoor in the floor of Castle Caldwell leads to a terrifying challenge! The Abduction of Princess Sylvia - On the eve of her wedding, the beautiful princess has been kidnapped! Can you save her in time? The Sanctuary of Elwyn the Ardent - A mystical chime of great power has been stolen - but by whom? In the wrong hands, the chime can cause untold harm! But can you find and defeat this mysterious and powerful creature?" Pages 129-160 are detachable play sheets and maps. "Welcome to the D&D® adventure game world! You have in your hands a compilation of the best of the D&D® adventures, from the earliest days of the game to the present. The whole has been reorganized and re-edited to provide a continuing set of adventures for characters of levels 1-3. This book is intended as a companion volume to the gazetteer GAZ1, The Grand Duchy of Karameikos. That book covers the affairs of the Duchy in depth, this one provides a series of detailed adventures taking place in that setting. The gazetteer is not required to play these adventures, but its background material is useful for extended campaign play. 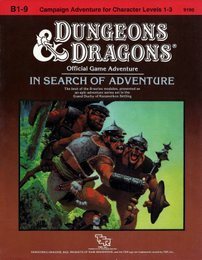 Most of the material in this book has been previously published in the B-series of adventure modules. To keep as much of the original material in print as possible, we have created an anthology of connected adventures, much like a collection of short stories. In selecting the material for this anthology, we have tried to gather as many different types of adventures and styles of play as possible. The overall campaign framework herein allows a high degree of player choice and flexibility for the DM, while generally keeping the adventures in order of difficulty. The early adventures are mostly exploratory in nature, while the last is a challenging adventure of political intrigue, with the characters likely to be working for opposing factions. All of the adventures are designed for 5-8 characters of level 1-3. The setting of the adventures is the Grand Duchy of Karameikos, a wild land overrun with monsters that is only nominally under the sway of its ruler, Duke Stefan Karameikos. Towns are few and often isolated by hostile humanoids. Small farms and hamlets dot the countryside, threatened on every side. Only by the efforts of the powerful and heroic few can the Grand Duchy survive, grow, and prosper. It is among this powerful elite that the player characters strive to take their place. The players' characters will begin in the small town of Threshold in the northern part of the Duchy. From here they will be able to proceed on any one of several adventures that will take them to the far corners of the Duchy and beyond, to return at last to the capital city of Specularum to prepare for even higher level adventures yet to come." There are 8 pages of separately-numbered ("PULL-OUT SHEET" I through VII) handouts in the center, bringing the actual page count to 64 pages. "Barely one day's march from Kelven, the uncharted tracts of the Dymrak forest conceal horrors enough to freeze the blood of civilized folk. Those who have ventured there tell how death comes quick to the unwary - for the woods at night are far worse than any dungeon. But you are adventurers, veterans of many battles, and the call of the wild is strong. Will you answer the call, or are you afraid of the dark terrors of the night? With a 64 page booklet, 2 double-panel covers, a double-sided, fold-out mapsheet and 120 die-cut counters, this super module provides all you need for epic wilderness and dungeon adventuring. Journey across the Grand Duchy of Karameikos in a desperate race against time and the forces of evil." "Someone has "borrowed" a cleric, and without him, the fabled King's Festival cannot go on. Unfortunately, it looks like the orcs have him, and your characters must rescue him. 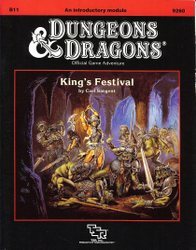 A great learning adventure, King's Festival provides players and DMs with a valuable introduction to fantasy role-playing in the land of Karameikos. Full of helpful hints for the players and the DM, this module also provides a full does of excitement! Orcs, carrion crawlers, and villains challenge the characters' fighting skills, and a host of traps and puzzles confound their wits!" "The wizard Kavorquian is dead. But certain items belonging to his adopted son were in the wizard's keeping at the time of his demise. Now someone must venture into the silent vaults of Kavorquian's stronghold and recover the missing property. 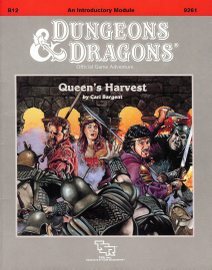 Queen's Harvest picks up its story where B11, King's Festival, left off. It can be played as a sequel to that adventure or as a complete adventure in itself. It is tailored for beginning Dungeon Masters and players and contains helpful hints on adventuring and the land of Karameikos. The story develops simply, but ultimately leads the player characters into the nether reaches of Penhaligon's politics to confront Ilyana Penhaligon, mad pretender to the throne!" "'A great cat sits upon the northern grasslands, my friend, waiting to pounce on adventurers just like you.' As you part the tall grass with your sword, the words of the tavernkeeper echo in you head. The ground rises slightly. A strong wind rushes through the field. Suddenly, the grasses part, and Lion Castle rises majestically before you! 'Magical riches await those who enter!' 'Beware of man-beasts!' Voices flood your head again. Will you brave the haunted castle? Can you afford not to? It's all up to you in this D&D Solo Adventure. 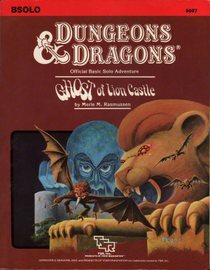 Ghost of Lion Castle is for one player only, but that one player makes all of the choices and enjoys all of the rewards. An entire castle and courtyard await your exploration. The adventure also includes a complete solo combat system."